Any utility billing, landscaping or supplemental fees you may collect from your tenants will be automatically generated by the the software and charged to your tenants whether you are at your computer or not. Recurring transactions may include garbage service, pet rent, landscaping, or internet service; whatever the service Rentec Direct helps you track funds and post them to the correct accounts automatically. 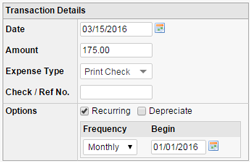 Learn how easy it is to setup an automated recurring transaction.